Most people know that to build anything you must have a good foundation. A sand castle cannot be built when the sand has too much water underneath it; first you must fill it in with dry sand. Without a good footer, a house will not have a solid foundation. The footer is what is laid down first and in some cases may even be supported by another structure made of wood or steel or concrete below. In the same way, to build relationships you must have a solid foundation. In fact, the Bible has much to say about the right foundation, which starts with Christ Jesus as the cornerstone. 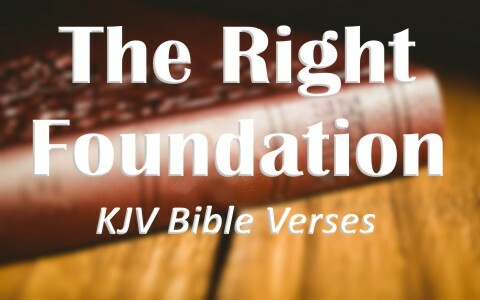 Here are some great KJV Bible verses about the right foundation. Luke 6:47–49 Whosoever cometh to me, and heareth my sayings, and doeth them, I will shew you to whom he is like: He is like a man which built an house, and digged deep, and laid the foundation on a rock: and when the flood arose, the stream beat vehemently upon that house, and could not shake it: for it was founded upon a rock. But he that heareth, and doeth not, is like a man that without a foundation built an house upon the earth; against which the stream did beat vehemently, and immediately it fell; and the ruin of that house was great. Acts 4:10–11 Be it known unto you all, and to all the people of Israel, that by the name of Jesus Christ of Nazareth, whom ye crucified, whom God raised from the dead, even by him doth this man stand here before you whole. This is the stone which was set at nought of you builders, which is become the head of the corner. 1 Corinthians 3:10–11 According to the grace of God which is given unto me, as a wise masterbuilder, I have laid the foundation, and another buildeth thereon. But let every man take heed how he buildeth thereupon. For other foundation can no man lay than that is laid, which is Jesus Christ. 2 Timothy 2:16–19 But shun profane and vain babblings: for they will increase unto more ungodliness. And their word will eat as doth a canker: of whom is Hymenaeus and Philetus; Who concerning the truth have erred, saying that the resurrection is past already; and overthrow the faith of some. Nevertheless the foundation of God standeth sure, having this seal, The Lord knoweth them that are his. And, Let every one that nameth the name of Christ depart from iniquity. 1 Peter 2:1–5 Wherefore laying aside all malice, and all guile, and hypocrisies, and envies, and all evil speakings, As newborn babes, desire the sincere milk of the word, that ye may grow thereby: If so be ye have tasted that the Lord is gracious. To whom coming, as unto a living stone, disallowed indeed of men, but chosen of God, and precious, Ye also, as lively stones, are built up a spiritual house, an holy priesthood, to offer up spiritual sacrifices, acceptable to God by Jesus Christ. Like anything you build, faith must have a good foundation or it cannot stand. The Bible confirms that the right foundation, the sure foundation and the only Master builder needed to sustain us this side of Heaven is Jesus the Christ. Do you know Jesus?